The Yangtze River cruise from Yichang to Chongqing sails 5 days and 4 nights upstream along the Yangtze River. And during the 5 days on the essence part of the river, travellers can enjoy a real tour of leisure with the perfect relaxing pace, watching the cities with modern charms, feel the natural sceneries of the passing by peculiar Three Gorges, highly recommended cultural and historical places of interests with pieces of classic poems, and spend wonderful time on the luxury cruises manned with professional staff. Let’s check the sample itinerary and popular cruise ships at below to start planning your Yichang Chongqing Yangtze River cruise. Yichang City holding the Three Gorges Dam Site and the Gezhouba Hydropower Station is reputed as the “City of Hydropower in the World”. Since it is the important place where the culture of ancient China developed and many famous poets created classic poems and words, a lot of domestic and international tourists visit Yichang to feel its culture, history and beauty. The Three Gorges consisting of the Qutang Gorge, Wu Gorge and Xiling Gorge boasts the impressing, magnificent and amazing natural views of high hills and flat water at the world only big gorge landform. Among these three gorges, Xiling Gorge is the longest one with the length of 76 kilometers in total, and the winding river, strange stones, elegant sightseeing makes Xiling Gorge a popular shining spot along Yangtze River cruise. The Three Gorges Dam is the largest and most complicated hydropower project in the whole world, which was designed and constructed for the benefits of navigation, flood control, river shipping, and tourism, etc. It is an extremely popular site for witness the project of human beings and comfortable sightseeing of natural flowers and floras, flood discharging and so on. Captain’s Welcome Party specially prepared by the famous and responsible cruise company will show the warm welcome from the cruise captain and all crews worth their salt. Furthermore, it is also a cool occasion for enjoying the rich kinds of delicious food and drinks, dancing with travellers from different countries and regions for relaxation, and making friends with others. Shennong Stream is totally 60 kilometers long. It is very famous for the tranquil and primitive sightseeing. Taking the local small boat to sail on the emerald water, watching the waterfalls, mists and fogs on the surface of the stream, feeling the minority ethnic customs and listening to the local popular tune of the boat tracker… In such a harmonious wonderland, time will be frozen in a particular wonderful minute to make people immerse into the happiness and leisure along the Yangtze River. Wu Gorge is famous for its elegant and serene sightseeing, and continuous towering mountains surrounded by clouds and mists, deep gorge cliff, and so on make it full of poetic romance. That’s why many famous ancient Chinese poets and celebrities have compliment Wu Gorge in their immortal compositions. And Qutang Gorge is featured with the rapid rolling water at the narrow riverway, which makes it majestic and precipitous. Sailing through the gorges offers the best moments to marvel at the amazing skill of nature and take amazing photos. Shibaozhai Pagoda is reputed as the “Pearl on the Yangtze River” and one of the world 8 strange structures by the Discovery Channel in America. Its 12-story red pagoda was constructed with wood, leaning the mountain, making this building a great place to seek an interesting climbing and a nice site for sceneries and stories. Fengdu Ghost City, the national only one shine for the leader of the underworld and the only place to show the Chinese culture of the afterlife, which gathers the cultures and customs of Confucianism, Taoism and Buddhism, telling people the consequences of doing good and bad things in their lifetime. The cruise captain will give their sincere appreciation and say goodbye to every guest during the Captain’s Farewell Dinner. Chongqing is a vital municipality of China and a cosmopolitan city centered with politics, economy, culture, technique, education, creation and art. In this city built on the mountain landform, you can enjoy facilitate traffic transportation, various kinds of local food, such as hot pot, many worth-going sites like Eling Park, Ciqikou Ancient Town, Three Gorges Museum, etc. There are all together 26 Yangtze River cruise ships sailing upstream from Yichang to Chongqing in 2019 with high standard facilities and amenities, praised services, delicious food, interesting activities and other entertainments, and recommendations from many cruise travellers and famous websites. 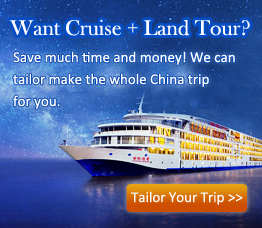 Select your ideal ship to cruise from Yichang to Chongqing at below. If you want to see other cruises, you can go and check all Yangtze River Cruise Ships 2019/2020 to have more options. 1. Detailed Time and Sites arranged in the itineraries and maps of each Yichang to Chongqing Yangtze River cruise ship are varied. Please check your specific favorite ship to see the detail info. 2. If you are more interested in Chongqing to Yichang Yangtze River cruise, please check the details to plan a 4 days & 3 nights Yangtze River cruise from Chongqing to Yichang, and if you want to know more information, please feel free contact our professional Travel Consultant for help. Top 3 Yangtze River tours chosen by most customers to explore Yangtze River in the best way. Check the detailed itinerary,or tailor your own trip now with us.